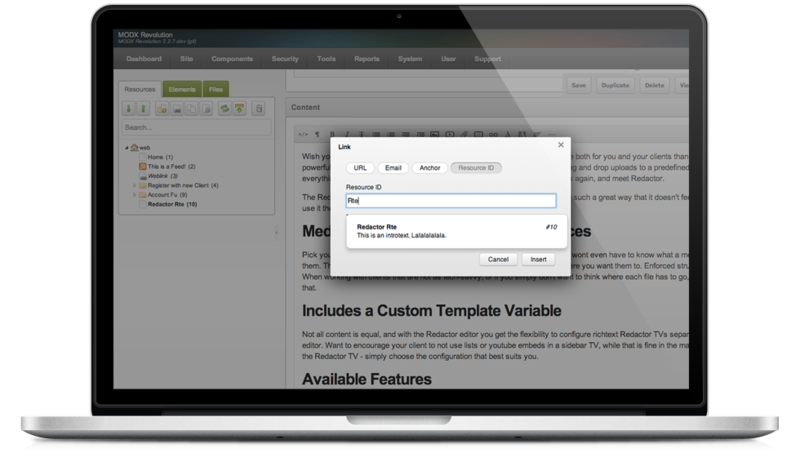 Wish you had an editor that has a cleaner interface and a better user experience both for you and your clients than TinyMCE? One that is powerful, but not complex? Full of powerful features, yet fully customizable? Drag and drop uploads to a predefined location, but still full access to everything already uploaded to your media sources? Too good to be true? Think again, and meet Redactor. The Redactor WYSIWYG editor has all the features you need, and then some, but does it in such a great way that it doesn't feel complicated or bloated. And with the various settings, you can use it the way you want to. Pick your preferred media source, optionally set an upload path, and your client wont even have to know what a media source is in order to use them. They just drag and drop their files and images, and they are uploaded where you want them to. Enforced structure with minimum effort. When working with clients that are not as tech-savvy, or if you simply don't want to think where each file has to go, it doesn't get much better than that. Not all content is equal, and with the Redactor editor you get the flexibility to configure richtext Redactor TVs separately from the main content editor. Want to encourage your client to not use lists or youtube embeds in a sidebar TV, while that is fine in the main content? No problem with the Redactor TV - simply choose the configuration that best suits you. If you don't want all this configuration goodness - no worries. Redactor will also enhance regular richtext-type Template Variables. Note: to use MIGX with Redactor richtext fields, you will need MIGX 2.5.6+ and Redactor 1.2.0+. The modmore Redactor package comes with all the features that the official version ships with, tuned and customized for usage within MODX where it makes sense. This gives you a lot of flexibility and power, in an affordable, simple to install package. On top of the core Redactor RTE, our package provides you with the following features. Manage most Redactor configuration options via System Settings. Create seperate Redactor instances using TVs. These can inherit their configuration from system settings, or override any of the options to provide a tuned experience. Simple drag and drop upload (or plain old file chooser if you want) into a predefined Media Source and optional upload path. Ability to browse existing uploads. Smooth injection of links to other Resources, no need to explain your clients what a [[~5]] does anymore. While we make our documentation as great as we can, sometimes you just need to talk to an actual human. We get that, and we're here for you. Just hit one of the big buttons below to get in touch with us, and we'll get back to you as soon as we can. Requires an account & purchase Pre-sales questions?